Fresh air, fresh snow, fresh food, and mulled wine -- the latter not for the kids! What's not to love about skiing in Europe? Whether you prefer Italy or Switzerland, France or Austria, there's something for everyone in the European mountains. Lech, Austria. One of the best resorts in Europe for tiny children to learn to ski is Lech in Austria. Renowned for their picturesque wooden chalets, lovely fluffy powdery snow, beautifully groomed slopes and child friendly facilities, the Austrian Alps are a great choice. Even better, Lech has its own "upper" resort: Oberlech, which is traffic-free and home to a handful of hotels, including the family-run, uber-cozy Goldenerberg Hotel. The chic resort is a regular haunt for Euro-royals, and they should know. Alpe d'Huez, France. 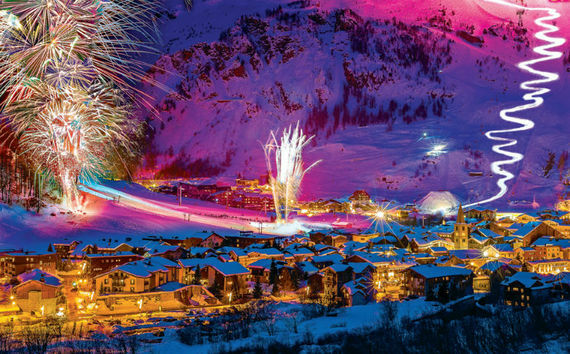 The Alpe D'Huez is a paradise for beginners with its vast choice of green runs. The quick DMS gondola whizzes you up the mountainside to a playground of gentle slopes, though one must always watch for incoming downhill quick traffic! Val D'Isere, France. With 300 kilometers of pistes, Val d'Isere has a lot to offer. You'd also be forgiven for thinking you're in the UK, rather than in France. Known for its "Britishness," there's no need to brush up on your French, as almost everyone is English here. Whether you want an English-speaking instructor, or can't remember how to order dinner en Francais... no problems! Don't forget to make a stop at La Folie Douce on the pistes for lunch or drinks -- a legendary spot. Canazei, Italy. A little more "exotic," here you will have to order your pasta in the local language! Good skiers will surely find the perfect slopes in Canazei, one of the picturesque villages in the Italian region of Trentino near the Austrian border, in the Val di Fassa. The Fassa valley, which has 122 kilometers of well-groomed pistes, is also connected to another 100 kilometers in Tre Valli and, best of all, linked to the Dolomiti Superski area, which is the world's largest ski circuit boasting 1,200 kilometers of runs. It's also great for off-piste thrills. Most hotels will have a kids club from 3 years on, and babysitting services for younger guests. The Ecole Française de Ski, which provides most of the skiing lessons in the French resorts, offers classes from 3 years of age, called the "piou piou." One can book lessons by the half-day or full day, with some clubs also providing lunchtime facilities as well as a nursery type environment with fun and games off the snow and a naptime session so you can pick up the kids mid afternoon. Toddlers need to be potty trained for ski lessons. If you prefer to holiday in total relaxation and have an in-house nanny, book with British company VIP ski that provides fantastic English speaking nannies alongside the rest of its catered chalet services. La Plagne, France. La Plagne isn't the prettiest or resorts but it's packed with things to do for kids, from a nearby farm, where one can ride friendly ponies, to the cute merry-go-around, which is, thankfully, indoors. The entire resort actually has an underground walkway which makes it very practical for circulating with little ones, avoiding the ice, and cold outdoors to get from A to B. You can shop, travel up to the other resorts by gondola, or pop to the restaurants without feeling the cold and, even, should you wish to do so, in your socks! Outside, the sledging run at the bottom of the pistes is also very popular with small snow bunnies. Verbier & St Moritz, Switzerland. If you prefer a little spa than ski, then hit the resorts of Verbier or St Moritz where it's rather more about the "apres," than the "during"! Even better, Verbier is home to the first W ski resort in Europe bringing edgy design to the mountainside. A master class in contemporary chalet cool, you'll find a choice of high end restaurants and bars, and of course plenty of pampering, including at the gorgeous AWAY Spa. In St. Moritz, the must go-to spa is at the Grand Hotel Kronenhof. It certainly has the wow factor with 2,000 square meters worth of pampering overlooking the Swiss glaciers -- with all the trimmings, from the saunas and steam rooms to a saltwater grotto, floatation bath, and even a relaxation room with an open fire.